Indian Crafts Welcome to an assorted expertise of blissful Indian crafts, intricate weaves and embroideries that assures to astound and sweep you in its arms. Pick up your shopping bags and venture with us in diversified lanes of India. Here's a reception to this absorbing kaleidoscope! 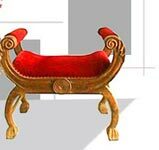 The history of Indian crafts comes from one of the established civilizations of the globe. Going back to almost 5000 years from present. The first references to Indian handicrafts can be found from the Indus Valley Civilization (3000 B.C.-1700 B.C.). The craft tradition in India has whirled around religious values, confined needs of the commoners, as well as the special needs of the clientele and royalty, along with an eye for overseas and home trade. Prehistorically Indian handicrafts were basically made for day after day use, the yearning for aesthetic application soon saw development of flooding designs and motifs. The incalculable artistic and ethnic assortment has enabled a fusion of motifs, techniques and crafts to increase on this land. The beauty of Indian textiles spread far and wide even during the ancient trade. The bandhanis and appliqué works stood apart from the herd. Kashida, kantha and kasuti were very popular for their fine quality and excellent embroidery done on them. The historic Indian literature reveals some interesting facts that India crafts were an integral part of religious rituals and ceremonies. The need to propagate Buddhist religion played an important part in the style the stone sculptures were sculpted. It also renewed the enthusiasm in stone sculptures. These craft ethnicity have withstood the ravages of time and frequent foreign invasions and continue to flourish till date. Create the ethnic Indian aura through the countless home products artistically crafted in different materials. • Terracotta Craft • Textile Products • Toys • Tribal Craft Of Darjeel..